So where were we? Oh, yes. The summer of 2004 changed my life forever. I was inspired as I watched so many children making the choice to follow Jesus Christ. Life was overwhelmingly rich, running on low-sleep and hard work; but each night I dropped into bed knowing that I had given my all for the Kingdom. Then came my sophomore year. Too many general education classes where no one cared a lick about what they were supposed to be learning. Too many pointless things to worry about. So many requirements from the education department. And the Kingdom kept calling... I found myself questioning everything about what I had accepted as my reality. Should I really be at college for the next two years? Should I really be in education? Wasn't there a world out there that needed to hear about Jesus? Could I really wait two more years to join the mission field? No, I couldn't wait. Yes, I wanted to teach. No, I didn't have to stay at college for the next two years. Yes, the world did (and does) desperately need to know Christ. So I left. The opportunity came up to be an education coordinator for the children of a missionary family in Argentina. I would only be gone a semester. I would even graduate on time. I would take a couple classes by correspondence while I was there. After weeks of pleading and badgering my parents, I was on a plane bound for Argentina. The plan was to stay for three months. I stayed for nine. The plan was then to return to college in the fall of 2005, but my heart was pulled in another direction. Another missionary was needing a maternity leave. Would I go home for the summer of 2005 to raise support so I could return in the fall to take up her work in Cordoba? God completely answered my prayers with a "yes." After nine months of supervising homeschool in Mendoza, I boarded a plane bound for Indiana, excited to be serving once again at Camp Good News for all the weeks of camp that I could in the midst of raising support. Teacher Man couldn't be there for the first week. He was at Word of Life Camp in New York, but as soon as he was back from his camp, he started work at ours. This was honestly the first summer I really noticed him. I was on staff as the resident missionary, talking to the children about missions and serving wherever there was a gap; and we finally had enough staff so that Teacher Man could just be the full-time lifeguard instead of serving as both the lifeguard and a senior counselor. We both had time on our hands so we sat out in front of the dining hall many afternoons just talking about what God was teaching us and where we saw Him leading. We broke one very important camp rule... a lot. The rule of threes. If a boy and a girl are together, there need to be three people there. The fact that we were breaking this rule never bothered me because there was no way anything was going to happen between this boy and me. He was headed to his freshman year of college in the fall at a school down the road from the college I attended. I was getting ready to board a plane to return to Argentina. We were two and a half years apart (still are for that matter!). No danger there. One night, as we were cleaning up from a huge all-camp game (Gold Rush, anyone?) and getting ready to open up the pool for a night swim, I remember sitting side by side with this grounded, kind young man, eating peanut butter dessert and talking about how God had called him to be a teacher so that he could reach out to the fatherless. I was (and still am) amazed by the vision he had for his life. A life of ministry. A life of sacrifice. A life that most people do not choose when they are eighteen years old. At the end of our weeks of camp, I handed him a copy of my support letter along with a prayer card. He wrote his AIM screen name (remember AIM?) for me on a scrap of paper, and we parted ways with a hug. I didn't think a thing about him for weeks. In August of 2005, I got back on a plane to Argentina, ready for my next adventure; but as with most things in Latin American, I had a lot of waiting ahead of me. The classes I was to teach did not start as soon as I arrived. The woman who would be mentoring me into the position was a huge help, but life just moved at a slower pace down there. If you know me personally, you know that I like to stay busy. Waiting is grueling to me, but wait I did. I spent a lot of time reading, studying Spanish, and getting know several university students from the church; but I still had a lot of time on my hands. So did Teacher Man. He was a freshman in college, who was way too good at school for that to take much of his time. What were we to do but talk for hours on AIM? Another man was interested in me and corresponded frequently, so I would ask Teacher Man questions to get a man's perspective. Teacher Man was interested in another young lady so I would give him a woman's opinion. On top of that, we ended up talking about music, theology, travel, education, and important qualities in a future spouse. All of this done with absolutely no interest in one another. I was still guarding my emotional purity; and I was honestly happy for Teacher Man to have a special young lady in his life. That took all the pressure off of our relationship. He was safe. He was wise beyond his years. And he became one of my best friends over those months of instant messaging across the globe. God called me back to the United States of America to finish my degree, starting spring semester 2006. 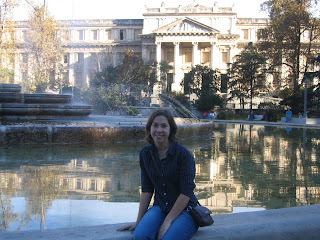 In December of 2005, I said goodbye to everything that had become normal to me in Argentina. As much as I was looking forward to being back in my homeland, I had a rough transition ahead of me. Same country. Same family. Same college. Different me. And on top of all these challenges was the excitement that the other man who had been corresponding with me was wanting to become a bigger part of my life. Want to know what happens next? Too bad! The children are racing around the house and we have a full evening ahead. Hope that satisfies those of you who were clamoring for Part 2. Blessings!